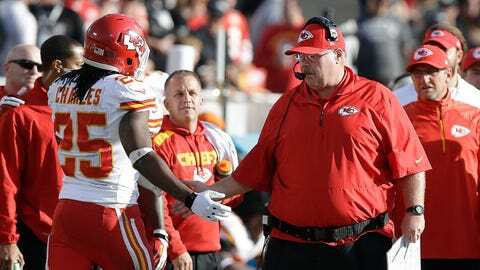 All signs point to Andy Reid giving starters like Jamaal Charles a rest in Week 17. KANSAS CITY, Mo. — What would be the bloody point? Sportsmanship? Credibility? Honor? Please. Bill Belichick laughs at your honor. On Planet Goodell, it’s win now and wrestle with your conscience later. So as to the question of whether the Kansas City Chiefs should rest some or all of their starters in a meaningless (but warm) contest in San Diego this weekend, well — it’s not really much of a question, is it? The Chiefs haven’t won in San Diego since September 2007. They haven’t won a postseason game anywhere since January 1994. The AFC postseason bracket is priority No. 1 now, period, full-stop. Everything else — Philip Rivers, Danny Woodhead, revenge for Week 12, Charger schadenfreude — is window dressing. The Chiefs can’t win a division. From a seeding standpoint, they can’t move up, they can’t move down. The only major, long-term good that can come out of Sunday’s Week 17 tilt at Qualcomm Stadium is that nobody gets hurt. And the best way to make sure that happens is to not play said people in the first place. Or to put it another way, when 2013-14 is done and dusted, what would you rather be saying the rest of the winter? "Hootie-hoo, we knocked the Chargers out of the playoffs!" or "We’d have beaten the blankety-blank Bengals if Jamaal Charles hadn’t blown a knee ligament in San Diego during Week 17!" It’s not really much of a choice, is it? So let’s get this straight: You’re cool with getting swept by the Chargers and letting them possibly backdoor into the playoffs? Yep. And, deep down, you’d have to think coach Andy Reid is, too. "I haven’t made up my mind yet," Reid said Monday when asked about who would be rested, and for how long, "exactly how we’re going to play." Although recent history suggests that he probably already has. With Philadelphia in 2001, Reid’s Eagles went into Week 17 with the No. 3 seed in the NFC already locked down, and rested his starters in the regular-season finale against Tampa Bay. The Eagles opened their playoff run against the Buccaneers just six days later back up in Philly, stomping Tampa, 31-9. Reid’s men rolled the Bears in Chicago in the divisional round but fell at St. Louis in the NFC Championship Game. In 2004, the coach sat his starters for most of Week 16 and all of Week 17. The first-teamers played one series during a Monday night appearance at St. Louis in the Eagles’ penultimate contest and few, if any, played the next weekend against Cincinnati. The Eagles lost both regular-season games but won their first two playoff tilts, against Minnesota and Atlanta, to notch a berth in Super Bowl XXXIX. In 2006, Philly hosted the Falcons in Week 17; once Reid knew the division title had been clinched, he began pulling his starters out of the contest. The Eagles subsequently won their wild-card date with the Giants at home but fell at New Orleans in the NFC’s divisional round. In 2010, Reid’s men locked down the No. 3 slot in the NFC playoff bracket during Week 16 and rested their No. 1s against Dallas the next week. Philly then lost its postseason opener at home to Green Bay. So, if you’re keeping score, since 2001 Reid’s teams have gone 3-1 in their playoff openers the years in which he rested his starters in Week 17, and 5-4, overall, in the postseason. "The one thing I said then, and I’m going to do now is, I’m going to take the time that I have to evaluate it," Reid said, "and make sure I do what I think is right in this situation. … There’s a bit of a gut feeling that you’re going off of and I’ll go off that." The gut says there’s an argument for keeping the starters fresh, for keeping to routine, especially the way the Chiefs looked at home (blecch!) against Indianapolis. Groovy. We get that. If that’s the coin of the realm, here, fine — you roll Week 17 of the regular season like Week 1 of the preseason. A series for Alex Smith and Charles, keep ’em loose — then yank the more valuable Christmas ornaments off the tree, bulb by bulb, before the kids start breaking them. That works, too. "I think it’s what you feel most comfortable with as a coach," Reid said. "The obvious benefit is that you rest your guys and then you kind of get them back feeling a little bit fresher than they are at the end of the season. You take the risk of the timing part of it. Sometimes that’s there, sometimes that’s not. But those are the things that you have to evaluate." When asked about the competitive "credibility" of fielding a first-team squad, Reid dropped another possible hint, noting some recent Colts teams that had clinched early and then proceeded to empty their bench to finish out the regular season. "And there’s obviously some rich talent there," the coach continued. "(Some) that won’t, I think, affect the integrity of the game, or (haven’t) affected the integrity of the game, and still kept the game at a very high level." If you’re reading the tea leaves on that one, limber up, Knile Davis. You, too, Chase Daniel. We’ll start the over-under on Charles touches at 3.5. And when Reid said Tamba Hali should be all right "down the road here," down the road better mean in Cincinnati or Indianapolis. This is the NFL. This is the postseason. You don’t owe the Dolphins, Steelers, Ravens or the ticket-buyers of San Diego a blasted thing. You owe the Colts plenty.